Having spent the better part of 2 days, actually 11 hours, in my truck with an aluminum canoe lashed down to the top of it, gave me plenty of time to ponder canoeing: past experiences before this canoe, times spent IN this particular canoe, and future experiences with it. I believe my first canoe trip was with my family when I young, living in NW lower Michigan. It would have been on the Platte River in the 50’s & 60’s where there were two or three canoe liveries located near a former state park, now Sleeping Bear National Lake Shore. I don’t recall a specific trip, but we would have rented a canoe from the Waterwheel Livery, our favorite. I do remember that the first part of the river was shallow in places and you could see minnows and water bugs swimming about. If too much time was spent wading you could end up with a leech on your leg, YIKES! The Platte was warm and good for swimming and wading at the beginning and the end, it was almost like bath water in places. My mom likely packed our red plaid picnic bag (purchased with Green Stamps) with a lunch and a Thermos cooler with either lemonade or Kool-Aid. After a couple of hours of paddling the end of the trip would sadly come at Lake Michigan. We would leave our canoe on the river edge for pick up and wade across to the opposite shore and nestle in a dune out of the wind and have our picnic lunch. We were allowed to swim after the “20 minute rule” so we played in the sand on the shore until that time had passed. My brother and I were very big on using goggles, snorkels, and swim fins which would be part of the fun in the river. This trip would not have been done very often, but as a special treat once a summer, if we were lucky. It would have been at the end of July between cherry harvest and the beginning of peaches. We were really tied down to the farm due to harvest times because my dad farmed pretty much 24/7 once the blooms broke out in Spring until late fall. Another memorable canoe outing was the time our church Pilgrim Fellowship group journeyed north to Grayling for a trip down a section of the AuSable River. First of all you have to know that the AuSable is the Mecca for fly fishing. Being a giddy group of teenagers, our initial encounter with fishermen brought forth a series of lectures on noise levels and not stirring up the water with our paddles. With red faces we immediately followed their requests and whispered the remainder of the trip and respected any fishermen we passed with mere floating and some necessary ruddering to steer clear. It was a beautiful float, mostly wild with occasional cabins scattered along the bank, a truly incredible experience of natural solitude. With the end of my senior year came another canoe trip, the annual Senior Skip Day. I know I was scared about doing it and worried about possibly getting into trouble, but the word was spread quickly and quietly among all seniors and a large group of us rented canoes and paddled down the Platte in the morning. We all felt totally illegal, but THAT energized the fun. In retrospect, I believe days like that are now outlawed with the threat of not walking across the stage to get your diploma. A while after college I married Cam, he often talked about his love for canoeing. One day on the way home from Traverse City I passed a yard sale near West Junior High and saw a canoe among the boxes and piles turned out for the sale. I stopped quickly and went back to inquire about it. It WAS part of the sale and could be bought for $125. It was a lot of money, but I paid for it and asked them to hold it while I tried to figure out how to get it home. I decided to zip home and borrow a farm pickup truck to haul it to our house. The canoe was in good shape, in fact, it had a WI boating license plastered on its Alumacraft bow. Well this canoe was a welcome surprise for Cam. We used it many times canoeing parts of the the Betsie,Platte and the Boardman Rivers. Cam annually reconnected with his college roommate Jerry, who also was a band director, to canoe on the Boardman. Jerry’s family had a cottage on Northport Point, north of Traverse City. Their family of girls would venture Up North from the thumb for a two week stay at their cottage every summer. Cam and Jerry would always phone and decide on a day to canoe. Cam even talked me in going with them one year, before Garrett and Aaron were born. I pretty much sat in the front of the canoe and dabbled my paddle in the river occasionally when needed, pretty much taking on a Princess attitude. It seemed to be a casual floating trip, then we hit the rapids, Cam hadn’t told me about them. The river dropped quite a bit and there were large boulders in the middle forming a short stretch of white water. Being a dry summer, the river level was lower than usual. Cam hollered for me to put down my paddle and to kneel in the bottom of the canoe and hang on to the sides while he tried to navigate the boulders. I did my best to help… by screaming the entire time. Within less than 30 seconds we managed to pass through my first experience of a small set of rapids. I am sure in my memory it was worse than what the actual event was and Cam and Jerry are both now gone, likely playing in God’s Heavenly Band . Later, after the arrival of Garrett and Aaron we added them to the event. Garrett was not very fond of canoes. He recently told me he still does not like canoeing. The tippy aspect really frightened him, when he was little. 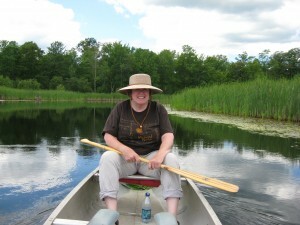 But not wanting to miss out on a unique experience, my friend Jane Purkis and I took both boys on a Carl Freeman bird watch canoe excursion on Grass Lake. It was our first time there, and the upper Betsie lazily meandered through a grassy area. We easily paddled up the river with the small group to Grass Lake. From the middle of the lake one had a good view of all the tall trees that bordered the lake. Carl, a local artist and photographer, was also an avid Audubon member. He brought portable telescopes and fancy binoculars for all of us to use. He pointed out an old eagle’s nest, in which the pair had returned over several years. It was massive in size: at least 6 feet high and likely a meter or 2 wide. Carl told us it was called an eyrie and would be added to each year of occupancy. We did see an eagle which was a rare sight in the 80’s and a few osprey, which was my first experience seeing them. There were many other water fowl he pointed out to us that morning. Our trip did not last real long, because Garrett suddenly decide he had had enough and wanted us to return to the car. Nothing would appease him, and a crying tirade began which was not welcomed by the bird watching folks, so we quickly paddled back out to the river and through the maze of tall grass to the parking lot. The river wiggled its way with many paths and they all looked the same and it would have been very easy to get lost. As the boys got older and so did Cam and I, the canoe was used less and less and could be found on its side on the west of the house waiting for someone to take it for another river adventure. occasionally it would be borrowed by friends or relatives who needed another canoe, but for the most part it just sadly weathered the summer against the house. Well, Grass Lake and the Betsie River brings me to recent past with this beloved canoe. My new friend Jon came from Wisconsin for our first face to face visit. I was advised by a friend with 3 daughters, that taking Jon on an outting in a canoe would tell me a lot about his personality. He happened to come on the 4th of July and we wanted to avoid the crowds and enjoy each other’s treasured company. So we attempted to load up the canoe onto the top of Jon’s Bonneville. The straps that Cam always used to tie down the tip and the tail of the canoe were unusually difficult to figure out. My son Aaron gave some help and off we went. I thought it would be best if we should avoid the popular river spots due to the holiday and remembered what a beautiful and quiet place Grass Lake was. 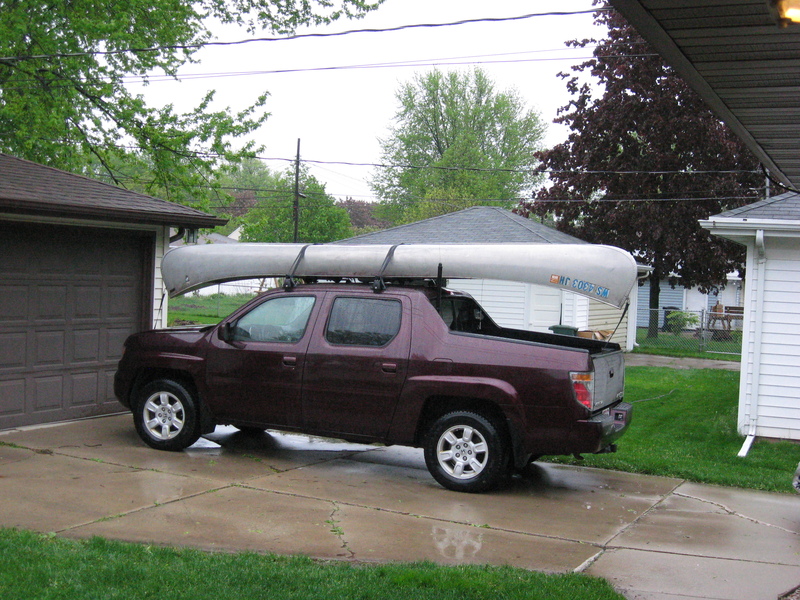 We had lots of trouble keeping the canoe on the car en route to the river. It kept sliding off the car, so we practically crawled to our destination to keep it in place on top, stopping among huge swarms of mosquitoes to realign the boat, occasionally. Jon dealt with the difficulties very calmly. We eventually arrived at the state forest campground where we parked and put into the river. We did so quickly, I paddled for a few strokes and then flipped around in my seat so we could talk more easily. We talked and paddled for more than hour or two and had not seen any signs of Grass Lake. We finally met some other canoers paddling in the opposite direction and asked them if we had passed the lake. They laughed and assured us we had definitely passed it and were almost to Green Lake. We promptly turned around and looked for it on our return trip back to the car, but never found it. 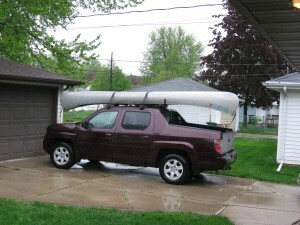 Well, Jon and I loaded the canoe up and headed for home with the same amount of trouble we had had going to the river. The canoe again, slid all over the place, but we drove slowly and on all the back road all the way to my house. That was a small part of our first face to face meeting, but Jon had passed the “Canoe Test” with flying colors, and a year later we would marry. At some other point in time, my friend Jane told me due to lack of precipitation Grass Lake had all but become a swale. So now, this beloved and once lonely canoe returns to Wisconsin. It will renew its acquaintance with the rivers and flowage of NE Wisconsin as a way of getting off the beaten track to explore. It will also provide a way to access the small lakes to fish. So little canoe, you are once again needed. Welcome home!